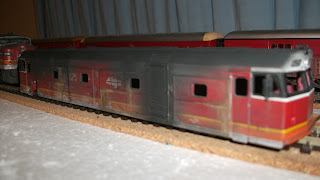 So after the Jumbo was licked up in the Candy livery it was time to weather it, though just prior to this i found that the Number decals i had used for the front on the cabs had yellowed after i had applied to decal setter, unhappy with this finish i had to sand the cab ends, re prime/paint/line and decal. But befor i decalled the ends i did some weathering. 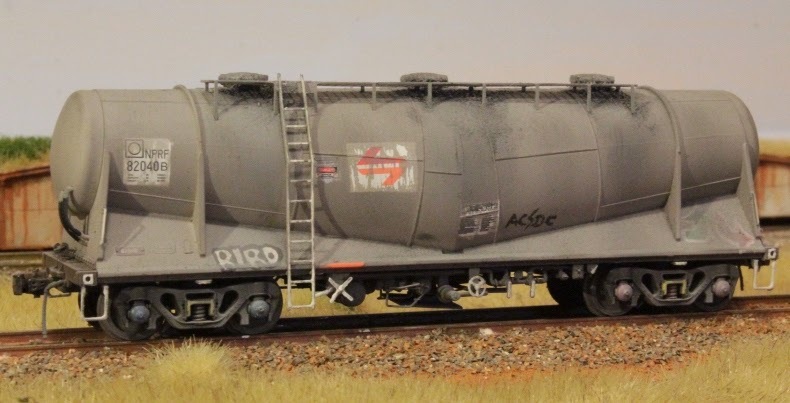 The guy who owns this model is modelling the late 80's/early 90's and wanted me to present the model as if it had been neglected since the take over of Freightrail (as the poor Alco's were) on the west and northern lines. I started off by removing some of the paint from the candy lines to show what they looked like when treated with the harsh acid washes they used to recieve . I then began blackening the roof (actually a dark grey) and doing the same to pretty much all the vents. I then added a bit of rust to some sills and body panel joins. Below is the result.